Let me say first off that I harbor no resentment against my friend for her statement. I think it is the purpose of friends to occasionally bring these blunt truths and perceptions to light, and there was no malice in her statement––just a wish to furnish me with some insight into myself and to perhaps stay my action in sending the angry and heartbroken letter. She went on to say she’d never had a birthday party in her life. Now that got me to thinking, because I’m sure if I have ever been with her on her birthday, that I would have thrown some kind of a party, even if it was just for the two of us; but perhaps she meant as a child and if this is so––and if expecting some sort of celebration of one’s existence on earth means one projects an air of entitlement––then she is correct, because I am a great believer in celebrations for whomever and for whatever purpose. Christmas is a big deal to me, even if it means making a crepe paper tree by twisting streamers from a central place on the ceiling overhead down to the various corners and edges of the tiny desk on an ocean liner–which I did when I happened to be on a boat mid-ocean one year for Christmas. Another time, when I was on another cruise with my sister and mother for Christmas, I even packed wrapped presents and a tiny foldable tree in my luggage. I believe that there are enough days to “rue” in this life, so given any excuse to celebrate, I’m going to take it. On Christmas, Thanksgiving, birthdays, Valentines Day, May Day, Halloween, Easter, New years and Day of the Dead––I’m going to use it as a reason to do something creative and something celebratory. Yes, I admit, over the years I’ve forgotten a few birthdays of friends and relatives not physically present. One other year, everyone forgot mine–even my mother––but when you are with me on your birthday, believe me, we’re going to celebrate it! Such events smooth out the choppy seas of life and give us something on which to pin our memories. Think back. How many of the best memories of your life involve celebrations of some sort? If I tried hard enough, I could probably remember more childhood events centering around holidays and celebrations than any other factor. 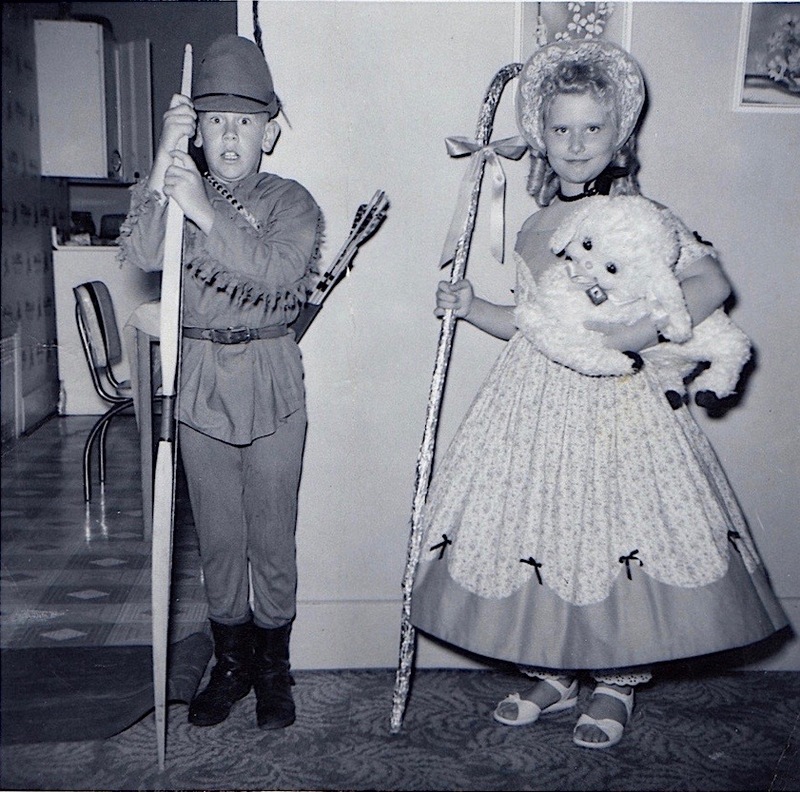 I vividly remember the costume party my sister had when she turned 13 and the complete southern belle ruffled hoop-skirted costume (complete with picture hat) that Kitty Reynolds made for Cheryl Lillibridge to wear to it–out of crepe paper! My sister went in our older sister’s prom dress, complete with a wrist corsage and dance book (remember those–with a tiny pencil attached for the guys who wanted to dance with you to sign up for a certain place in line on your list?) I went as Alice in Wonderland, accompanied by my sister’s giant yellow “white” rabbit. At any rate, I was going to list a number of other examples of memories associated with Christmas and other holidays, but I think I’ve proven my point as clearly as I would have if I were to give twenty more examples, so I won’t. The point is that life is going to furnish us with countless choppy seas. In the past few months, this has been especially true with friends and friends of friends suffering terrible tragedies. In some cases, it has been almost too much to bear, but in the midst of all this sadness, we continue to plan these special life events: Easter egg hunts, reunions, summer camps for kids, special dinners with friends, birthday celebrations, writing retreats and trips to far-off places to visit friends we’ve been promising to take for years. Because life on its own doesn’t furnish us with very many smooth spaces, I think we need to furnish them for ourselves! “Civilization is a stream with banks. The stream is sometimes filled with blood from people killing, stealing, shouting and doing things historians usually record, while on the banks, unnoticed, people build homes, make love, raise children, sing songs, write poetry. I think Mr. Durant will forgive me if I add one item to his riverbank list of activities. The word I would add is “celebrate.” It is one more everyday occurrence between people living their ordinary lives that helps to smooth out the bumps that the “big things” provide. Billy Sorenson and I dressed up as characters from fiction for our town’s 50th anniversary parade. Why Robin Hood looks terrified of Little Bo Peep and why she looks like the cat who has swallowed the canary is lost in the annals of history. 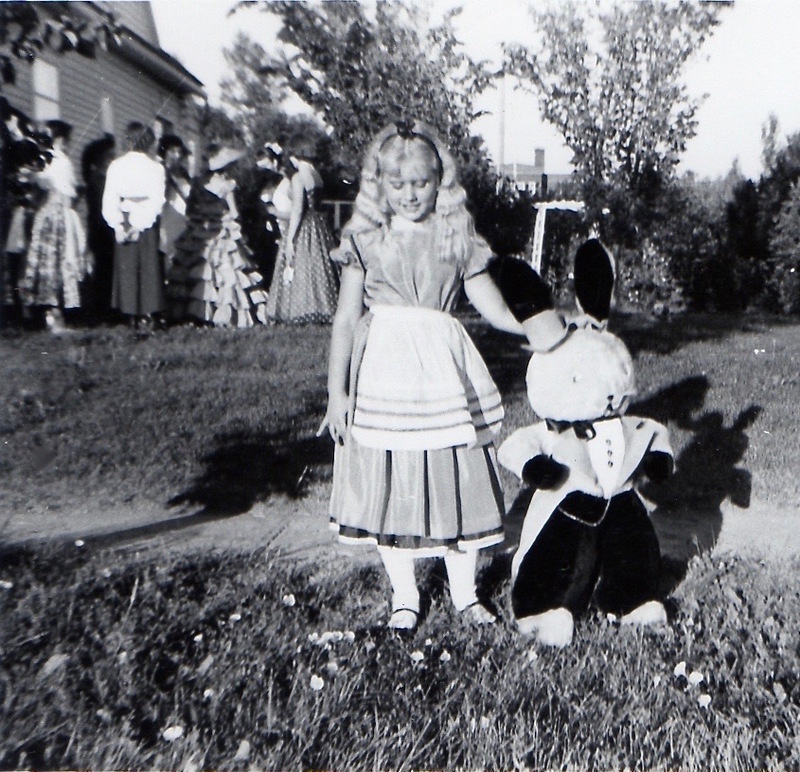 If my sisters hadn’t been fond of very large stuffed animals, I would have been limited in my costume props. The sheep was won for my sister Betty by her boyfriend who spent a lot of quarters and got a sore arm tossing balls to win her favor. The big rabbit in the first photo was my sister Patti’s. P.S. Remember that little twig in the ground I was sitting next to as a two year old in “Dreams of Flying” ? It is the same tree pictured in the first picture above. It took seven years to grow even that big–which is how slowly trees grow in the dry climate of South Dakota, even though I’m sure my dad or mom probably watered it daily. It would have been that size in less than a year in Mexico. This entry was posted in Celebrations and tagged Best Friends, birthdays, Celebrations, childhood memories, essay about celebrations, favorite memories, overcoming life's misfortunes, smoothing out the rough spots on June 5, 2016 by lifelessons.